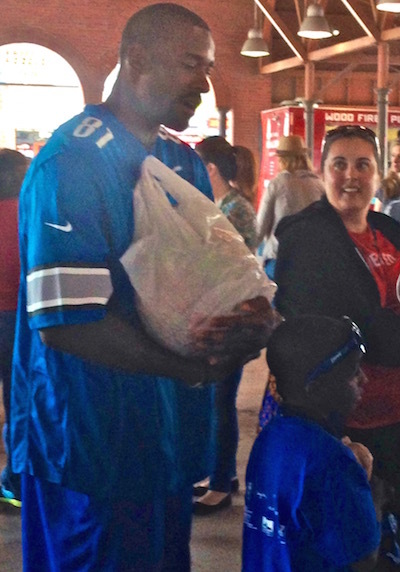 Above is an iFolloSports.com original photo of Lions all-time great WR Calvin Johnson appearing at the recent “Meet Up & Eat Up” community event at Detroit’s Eastern Market (one mile northeast of Ford Field). The goal of the program is to promote healthy eating, as well as address hunger issues in the Detroit area. The picture was provided by iFolloSports.com Michigan correspondent Lance Martinez. Now in his ninth NFL season, Johnson’s 76 career TD’s place him tied for 27th in league history. Remarkably, the Georgia native has accrued double-digit regular season scores on 4 occasions.